Nature is a sensuous, adorable, gorgeous Being. She is an Artist. And she nibbles at us in each moment. Small motions of contact, branch on leg, wind on cheek, bird overhead. Taking time to be with her, with full attention, focus and wide eyed awe, is possibly the most important part of each day. It is when i feel most fully alive. When the mind stops, and the observer is not observing the mind, but rather – the view. And the gifts within it. When I am separated from nature, (as is apt to occur when travelling to the urban jungle), the strain of the disconnection tugs at my soul until I can’t bear another day in the grid of wi-fi signals, steel and concrete. Generally, when my soul has overstayed its self imposed welcome in urbanity … a gust of wind swoops me up (Mary Poppins style), and moves me on my way to the next destination. (In this most recent case, plopping me directly back in the lap of my beloved redwoods, in Northern California). I just returned to the redwoods from a week long journey during which I swam in the sizzling soup of human electricity that is Venice Beach. While there, i spent more time in my car than i have in months. (Holy Traffic Batman!) So much rubber, so much pavement. Between me and the ground. Not enough trees. Not enough clean moist air. NO clean air! Augh! The best i could do to ground in, was to lay face first on the beach each day, or walk for a bit on the sand. (There’s always the option to throw your arms around a cement-caged tree). It’s just not the same as walking in solitude down a mile of rugged coastline, or walking through a 1000 year old redwood forest. Nearly every day around sunset, up in northern California, I walk the beach at Jenner, where the Russian River runs out into the Pacific. 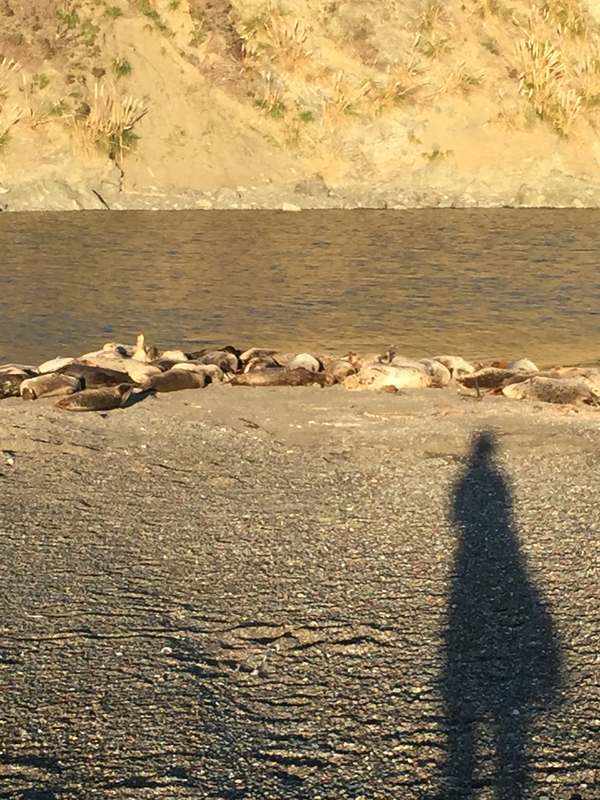 There is a community of seals who birth their pups there, who rest on the shore, frolick and fish in the mouth of the river. Today they were surfing the river current as it flowed out to sea, chasing eels and fish. They rolled in the surf like children spinning down grassy hills … they writhed and wriggled with their lithe muscular shimmering-sheened bodies … looking like worms who crossbred with wide eyed puppy dogs. We sat on the sand and watched dozens of seals hunting. Their little heads would pop up in the river, mere feet in front of us, then dodge and disappear beneath the current. They would come up to the surface with a thrashing fish in their jaws, and then whack them against the water. Fiercely. Thwacking them until the fish’s spines were surely broken by the sheer force of the body slam. Blood gushed forth into the foaming water. Fish eyeballs flew as the seemingly innocuous seals became killing machines. Our jaws silently dropped and hit the beach as we froze in the sheer awe of observation. It was barbaric. It was awe inspiring. It was ferocious. It was beautiful. It was … humbling. There are a million ways to bow and kiss the ground. To witness this act was breathtaking in such a hypnotic way that nothing else existed but that performance art by mother nature. A true gift of immeasurable value. A million ways to bow and kiss the ground. But what matters, my beloved city dwelling humans … is that we touch the earth. A fingertip’s kiss is enough. And never enough. Whenever we touch her flesh suit, (planetary portal, metaphorical, metaphysical, performance Artist / puppeteer extraordinaire) – and watch the generous brilliance of her 3 dimensional holographic art installation …. it unfolds so generously before our eyes. Every bird winging. Every wind song singing. Who needs a movie when we’ve got nature unfolding in all her magnificence?? Pure entertainment value! Excellent imagery here! I love your writing.